Experienced pace bowler Max Sorensen has been left out of the 15-man Ireland squad for the pre-World Cup tour to the United Arab Emirates from 4-19 January. Other notable absentees from the group include all-rounder Andrew White and batsman Andrew Poynter. Craig Young, Andrew McBrine, Andrew Balbirnie and Peter Chase are selected. The tour will comprise two one-day internationals against Afghanistan and two against Scotland, in preparation for the Cricket World Cup in February. The squad for the World Cup in Australia and New Zealand will be finalised in early January, and must be submitted to the International Cricket Council by 7 January. "There is a nice balance to the squad, which has a huge wealth of experience, but also a few young guns," said Ireland head coach Phil Simmons. "There are four players who have played in two World Cups and also nine of the squad who played in our record run chase against England in Bangalore in the 2011 World Cup. "We are backing young Donemana spinner Andrew McBrine, who particularly impressed in the New Zealand leg of the acclimatisation tour, but it's very unfortunate for Andrew White that his finger injury came at such a bad time for him." Ireland's opening attack in the 2011 World Cup was the retired Trent Johnston and Boyd Rankin, who has switched allegiance to England, and Simmons has opted for youth to fill the considerable void left by their absence. "Craig Young has been fantastic since he broke into the team, and has continued to develop, while Peter Chase is growing in confidence and skill all the time. Peter, with his pace and extra bounce, is important for the type of Australian wickets we will play on in the UAE," he said. Simmons was delighted at the consistent progress made by Balbirnie, who has been the stand-out Irish performer in recent months. "Andrew's form with the bat has been outstanding, with excellent performances in Australasia and in Dubai recently against a strong New Zealand A team. His runs on tour have helped him force his way into the squad," he added. "It was a very difficult decision for the selectors to leave out Max Sorensen and Andrew Poynter but this just shows the competition for places in the squad." Former Ireland international Alan Lewis, now chairman of the national selectors, said of the squad: "It's certainly been the toughest selection meeting I've been involved with. "We have been very impressed with the way a number of players have stood up and performed well in the last few months with tours to UAE and Australia and New Zealand. "The push for places has been incredibly competitive, which is an excellent indication of the greater depth of players we now have. It's also refreshing to have no fewer than 13 of the 15 come through our youth system, which is a great vindication of our under-age coaching structures. "For players like Max and Andrew to miss out is testament to the competitive nature of the contracted players which is exactly what the selectors were looking for. "Both will know that one injury could create an opportunity and this will be no different for young guns Stuart Poynter and Graeme McCarter who have also impressed so much over the last few months." "All the players know that one injury could create another opportunity for a fringe player, so all those players not selected need to be prepared to step in at any time." 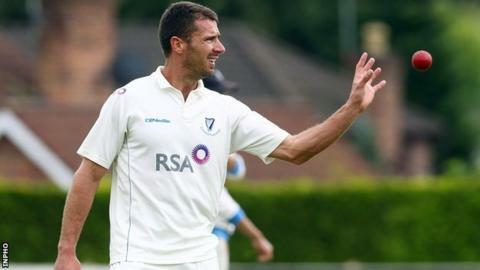 Ireland squad for one-day internationals against Scotland and Afghanistan: William Porterfield (Warwickshire, captain), Andrew Balbirnie (Middlesex), Peter Chase (Malahide), Alex Cusack (Clontarf), George Dockrell (Somerset), Ed Joyce (Sussex), Andrew McBrine (Donemana), John Mooney (North County), Tim Murtagh (Middlesex), Kevin O'Brien (Railway Union), Niall O'Brien (Leicestershire, wk), Paul Stirling (Middlesex), Stuart Thompson (Eglinton), Gary Wilson (Surrey, wk), Craig Young (Bready).